Make your friends ask "What's in your basket?" with our stictched canvas bags with burlap lining by Style In Print Designs. Give the terrific tot a personalized Easter basket they'll want to use all the time, or show a mother-to-be some extra "TLC" with a specialty basket their child will cherish for years to come. HIGH QUALITY PRINT: Printed in the USA. Professional quality UV-resistant inks. Pigment-based and designed to last. Printed artwork looks absolutely stunning with brilliant finish. Print quality doesn't get any better than this! Professional quality printing provides stunning detail and rich, lifelike colors. All prints are made in our labs in Tampa, Florida. 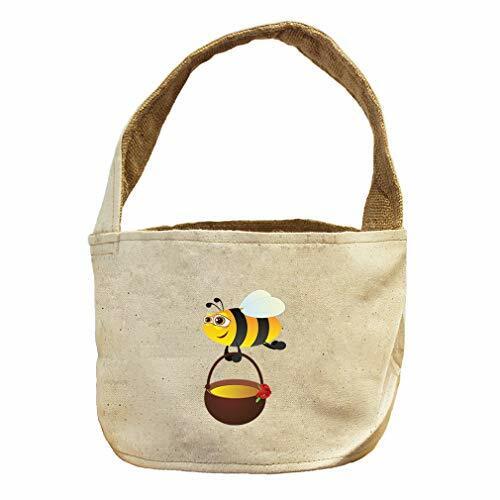 GREAT GIFT IDEA: Stitched canvas bags with burlap lining and tall handle are perfect for gift baskets, Easter Baskets, Teacher gifts, Hostess gifts and more. GOING GREEN: Cotton canvas and jute are natural fibres. Reduce your foot print using natural fibre fabrics they are more friendly with our environment. BEWARE OF COUNTERFEIT: All Style in Print Products are printed in and shipped from the USA. Be aware of counterfeit sellers with inferior products. Our products will never ship from China or overseas. View More In Shelf Baskets. If you have any questions about this product by Style in Print, contact us by completing and submitting the form below. If you are looking for a specif part number, please include it with your message. PiccoCasa Foldable Toy Storage Bins Square Cartoon Animal Storage Box Eco-Friendly Fabric Storage Cubes Organizer for Bedroom Playroom Orange Squirrel No Lid 13"x13"x13"